« How CIBIL / Credit Bureaus protect Indian Banking System & Consumers ? 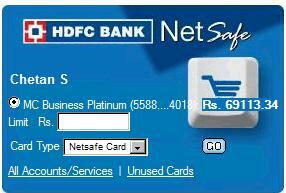 How to Create & Use HDFC NetSafe Virtual Credit Card for Online Transactions? Due to increasing fraud in stealing Credit Card numbers from Online Merchant websites, 3 years ago RBI made it mandatory to have a Second Password Authentication – MasterCard SecureCode / Verified by Visa. This brought down the fraud to a great extent. But loophole remains, if your card details is stolen from some e-retailer where you have transacted, it could be easily used on websites outside India bypassing the MasterCard SecureCode /Verified by Visa. To avoid such problems, you now have Virtual Credit Cards. 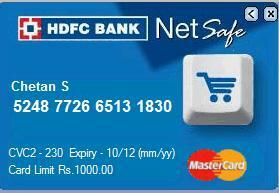 Go to the HDFC Bank Website and Log on to NetSafe / VBV / MasterCard. 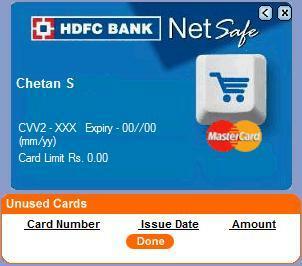 Once Logged in, you will see a screen as shown below – Shows your name, existing credit card number, Available Limit that can be used to create NetSafe Card. You enter the amount in the “Limit” text box and press “Go” which will create your HDFC NetSafe Credit Card to be used for online shopping or e-commerce. The best practice is to generate this new card for a limit little greater than the amount you will need to shop. We were BUYING books worth Rs 900 and thus generated a card of Rs 1000 as shown below. It comes with 16 Digit Card Number, 3 Digit CVV and ean expiration date. However, in reality, the NetSafe Card expires within 24-36 hours after generation for increased security purpose. We transacted for an amount of Rs 900. Now what happens to the balance amount ? HDFC cards division will bill on your actual credit card an amount of Rs 900 only, so there is no tension of using the remaining Rs 100 or asking for refund etc and the NetSafe card is exhausted or ceases to exist. You can check the Balance in the HDFC Bank’s online interface and it will appear as shown below. You can see NetSafe card limit set to Zero and No Unused Cards are Listed. So start generating NetSafe cards for your online shopping so that even in the unfortunate event of website being hacked, your credit card faces no risk at all. 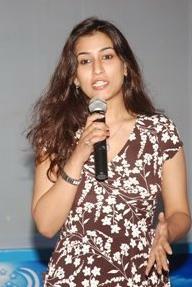 This entry was posted on Wednesday, August 1st, 2012 at 9:00 am	and is filed under HDFC Credit Card.